This was a trip of several firsts. 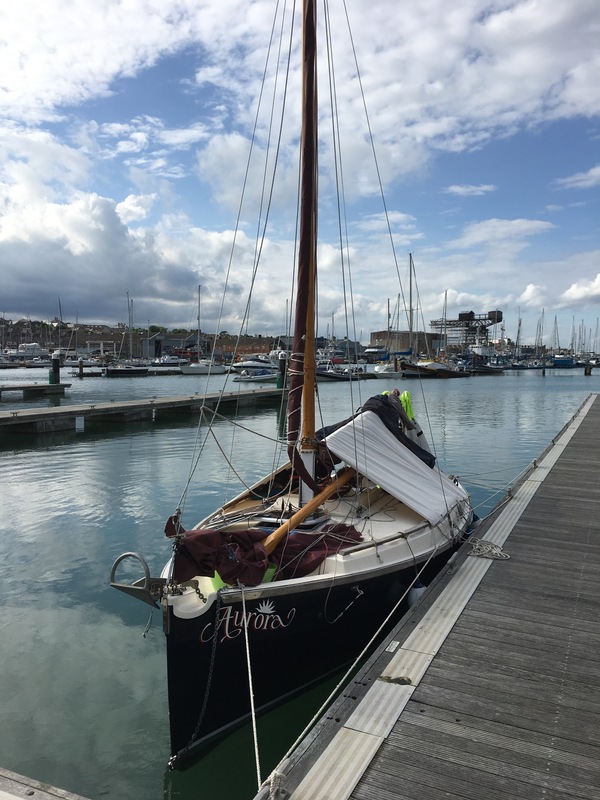 It was the first time we arrived at Gosport with Aurora ready on her mooring. It was also the fist time I have been to Cowes, but more of that later. We arrived at the club about an hour later than we should have done, and there was some doubt in my mind as to whether there was enough water to get Aurora off the mooring onto a pontoon berth. So, there was a comedy dinghy episode, in which the under-inflated Aurelia was rather more bendy than she should have been, almost leading to me losing the oars whilst the outboard tilted the dinghy transom to an interesting angle. I also spent about 10 minutes trying to work out how to tilt the new outboard engine. The final challenge was my discovery that the centre plate was jammed. No amount of tugging or rattling would convince it to drop. I left it cleated with only a little slack, so that if it suddenly decided to drop, it would not whack the centre board casing. Aurora was eventually on a pontoon berth and we went out for a Chinese meal- surprisingly few options in Gosport at 9pm on a (Bank Holiday) Monday evening. Alice and I spent the night on the boat, whilst Niki and Aimee preferred to sleep in the van. Our plan for this trip was to work our way West to Yarmouth, but this didn’t fit easily with the Southwesterlies forecast for the next few days. However with little wind forecast for tomorrow I decided we should take it on the nose. The mouth of Portsmouth harbour was busy as usual with its complement of ferries, hovercraft, power boats and yachts. We missed a trick and sailed out towards the channel- there was enough water for us to have kept close to the shore, which would have saved us from a couple of large tacks, as well as the foul tide. 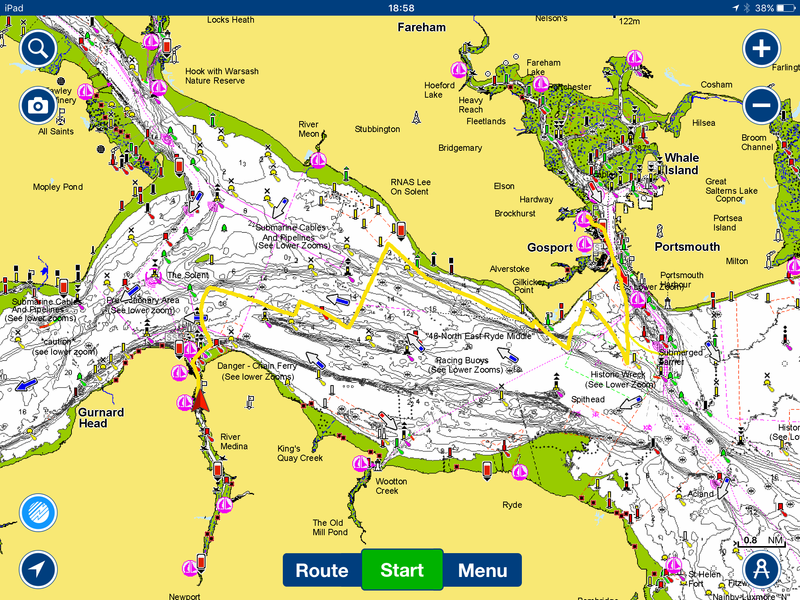 We beat our way along the shore, past Gilkicker Point and as far as Lee-on-Solent, before we tacked away. It was only at this point that we were committed to the Island; till we tacked, we could have continued to Southampton or the Hamble. Done that trip many times. Newtown Creek tomorrow, I hope. Wish I was out there too, unfortunately working. I had Ladybird’s plate jammed up last summer after taking the bottom up the river Fowey. Like you, no sign of anything wrong until gravity does not pull the plate down again. This turned out to be a real pain to sort out. I had to pull the boat out on a yard lift that left the underside opening clear. Jet washed as much sand and mud out of the gaps as I could. This was followed by some almighty great belting of the top of the plate via a metal bar through the inspection hatch using a club hammer. I really had to pound the plate out hard with repeated heavy blows over 20 minutes as it moved fractions of a mm each time. Then eventually it dropped out so make sure you have something to catch it before it hits the front of the box. This in my case was caused by alignment build tolerance errors in the centre board box which is not perfectly straight. The plate is straight and the box is slightly curved and there are three pinch points that create wedge shaped voids that can get grit jammed in them as the plate lifts so it does not go down again. Get in touch if you want any help. Thanks for the advice, Andrew. Turns out Irene had this problem too. I had a go at whacking with a hammer on the top of the plate too, but only moved the plate a few mm. I’m worried about damaging the centre plate, so I might drill a hole in the top of the casing, so I can insert a chisel and apply direct downward force. The hold could be capped by a dinghy drain plug fitting. Our centre plate casing seems wider than other CC19’s. as our centre plate seems to “clonk” more than others (when it was down, that is). No tools here, so I’ll have to wait until I get Aurora back to Gosport.